Posted on August 24, 2012, 3:04 pm, by Thomas Hawk, under Photo Talk Plus. Lotus Carroll and I had a great time this past Wednesday with panelists Chris Chabot, Jan Kabili, Joe Azure, Karen Hutton, Keith Barrett, and our special guest Tom Hogarty, Adobe Lightroom Product Manager. We discussed news stories, including 20 Pro Tips for Photographers on Google+ (http://goo.gl/2tLsx), the new Android Powered Nikon, and hidden view counts for your photos on Google+ (hint: you have to go to Picasa). Tom gave us some cool demos in LR4 and answered questions for us about everyone’s favorite photo editing program. If you’re not using Lighroom 4, well, you should be. After you watch the show, enter our contest to win one of two copies of Lightroom 4 from Adobe (each will come with a free copy of Trey Ratcliff‘s new and amazing LR4 Presets!). To enter all you need to do is make a post on Google+ and tell us either: your favorite feature we discussed on the show, make a feature request, or talk about how you will use LR4 if you win it. You must include the hashtag #LightroomPlus in your post. You have until next Wednesday when we’ll pick the two best and announce those winners on our show that day at 8PM Pacific. Congratulations to Billy Wilson, who won a copy of LR4 and Trey’s presets live on the show, courtesy of SmugMug (who also threw in a free year of their Pro Service) because they are one of our fantastic sponsors, who are also well integrated with Lightroom. We love them! Follow us at Photo Talk Plus for more! Posted on August 22, 2012, 5:50 am, by Thomas Hawk, under Photo Talk Plus. We discussed several stories including new Google+ features (vanity URLS, slideshows, album downloads), the release of the new Canon 6D, new photo sharing site Medium, and the Portland Press Herald stealing a woman’s flickr photos and then paying her for them when caught (and more). Afterwards, we interviewed Kelli Seeger Kim, learning more about her photography and getting to look at it up close, discover what drives her passion and what she’s planning for the future. And make sure you tune into http://vidcastnetwork.com tonight night at 8PM Pacific when our special guest will be Lightroom Product Manager Tom Hogarty! We’ll be talking about Lightroom 4 and you’ll even have the chance to win one of two free copies to be given away, as well as a chance to win Trey Ratcliff‘s amazing new Lightroom 4 presets, available here: http://www.stuckincustoms.com/lightroom-presets/ Watch the show to find out how. 🙂 See you there tomorrow night! Posted on July 26, 2012, 9:01 am, by Thomas Hawk, under Photo Talk Plus. What a great show we had last night with the one and only godfather of light painting and night photography Mr. Lost America Troy Paiva. In last night’s show we talked all about Troy’s work — his technique, his gear, his social engineering, his workshops, and lots of other tips on how you can make these sorts of photographs yourself. For a more thorough run down on all of Troy’s tips and techniques be sure to get a copy of his third book “Light Painted Night Photography” on Trey Ratcliff’s Flatbooks store. Also be sure and check out Troy’s work at his website http://lostamerica.com. Joining Lotus Carroll and myself last night were Keith Barrett, Ricardo Lagos, Amy Heiden, Scott Frederick and Ian Ference. We also discussed the new Canon mirrorless camera, Scott Jarvie’s upcoming Photography Decathlon, the winner of our SmugMug / Blurb Books photo project contest Jordana Wright, a wedding photographer who is being threatened with a $300,000 lawsuit, the new Epson V700 scanner that I ordered from Adorama yesterday, a photo by Alex Koloskov and lots more! Join us LIVE tonight July 25th at 8PM PST for Photo Talk Plus!!!!! Posted on July 25, 2012, 12:07 pm, by Thomas Hawk, under Photo Talk Plus. Tonight’s Photo Talk Plus is going to be AWESOME!!!! We have none other than the pioneer and godfather of abandoned night photography himself Troy Paiva as our special guest. Troy has been making amazing light painted night photographs for over two decades. Along the way he’s published three books and published thousands of photgraphs online, including many at his website http://lostamerica.com Troy’s documented the out of the way, abandoned California desert in ways that few others will ever come close to. He regularly holds workshops on his well regarded technique. 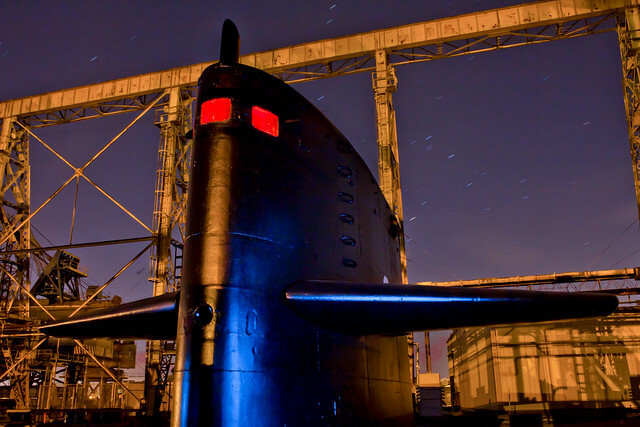 Troy has long been a big influence of mine and it’s his distinctive night scenes that have encouraged me to pursue some of this type of work of my own (like this image of a submarine on Mare Island here). We will have some wonderful panelists joining Lotus Carroll and I tonight to help interview Troy who also are greats themselves in abandoned photography including Sly Vegas, Scott Frederick, Amy Heiden, Ian Ference, Ricardo Lagos and as always Vidcast Network’s wonderful host Keith Barrett. We will also have some interesting stories on this week’s show including the new Canon mirrorless camera, the winner of our Blurb Books / SmugMug photo project giveway, an update on Scott Jarvie’s Photography Decathlon, a story about a wedding photographer who was threatened by a lawyer with a $300,000 lawsuit, and tips on how to maximize the potential of your photo posts on Google+. 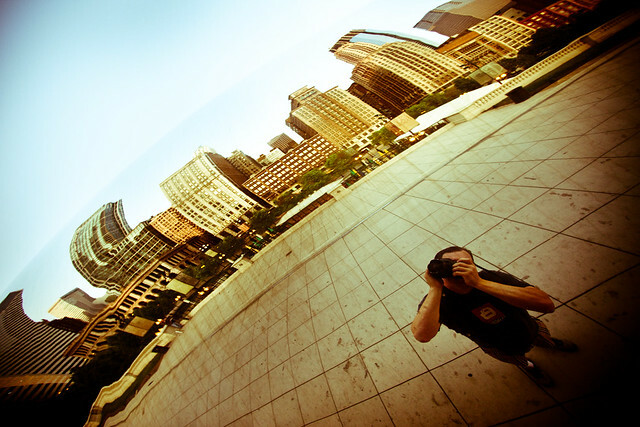 Posted on July 12, 2012, 10:07 am, by Thomas Hawk, under Photo Talk Plus. Photo Talk Plus, Episode 30!!!! Wow, we made it to 30 episodes! We had a GREAT show last night on Photo Talk Plus with the one and only Brian Matiash from onOne Software. Brian talked about his role with onOne and we had a great time going through some of his impressive photos on the show as well. Joining Lotus Carroll and myself were panelists Keith Barrett, Google’s Events Product Manager Zach Yeskel, Karen Hutton, Kerry Murphy and Jan Kabili. Catherine Hall made a guest appearance as well to talk about her new video show coming out Photography Unfiltered. We also had a few extras pop in including the ever present Billy Wilson and his cat Tibby as well as Brian Matiash‘s leading lady Nicole S. Young. Brian Matiash has a wonderful processing style and I especially enjoyed going through some of his urbex photos and learning more about how and where he made them. Last night’s stories included, the new G+ iPad app, +Catherine Hall’s new show, changes made to the “Get Started” G+ list for photographers, PHOTIGY’s HDR Processing contest, the new incredibly expensive Cintiq 24 inch HD Touch tablet, and Issue #2 of Exposed – G+ Photography Journal. Lotus showed off her awesome new Canon 100mm f/2.8 L series lens (which I also own and LOVE too and shot like crazy shooting macros at the Denver botanical garden) and which you should totally go and buy from Adorama right now here!!! As always, thank you to everyone who watched live and participated in the chat room as well as our amazing show sponsors who we love dearly, Adorama, Blurb Books, Drobo, and SmugMug. Join us next week when we interview the incredible Daniel Milnor!!! Posted on July 9, 2012, 11:30 am, by Thomas Hawk, under Photo Talk Plus. Well we had a fantastic show last week interviewing the one and only Chrysta Rae who so many of you know and love on Google+. We talked with Chrysta about her own work as well as her work as one of the great Google+ curators with her wildly popular Scavenger Hunt. Not only has Chrysta broken G+ is some truly epic ways, she has introduced us to so many great photographers each month with her hunt. Joining Lotus Carroll and myself for this show were panelists Keith Barrett, Mandy Sloan, Alan Shapiro, Daniel Milnor and Lynne Goodwin. In this episode we revisit the The Google+ One Year Anniversary Photowalk and talk about the walks that we went on, including mine in Denver, CO and Lotus’ in Austin, The July Scavenger Hunt, Trey Ratcliff’s Top 5 Tips for photographing people, Colby Brown’s Heart of a Sunflower and Ron Clifford’s post about photographing fireworks. Join us this Wednesday night when our special guest for Episode 30 will be Adobe’s Lightroom Product Manager Tom Hogarty. Tom’s going to talk about what’s new in Lightroom and hopefully what may be in store for the future from the web’s most popular image processing software company. Posted on June 21, 2012, 10:59 am, by Thomas Hawk, under Photo Talk Plus. Lotus Carroll and I had a GREAT time last night interviewing the wonderful Tamara Pruessner. Some of you know Tamara through her photo work on Google+ as well as her work as one of the hosts on the photography video show Life Through the Lens. Tamara talked about her photography work as a storm chaser, her work with flowers and her future plans in the upcoming year. Panelists for last night show included Scott Jarvie, Tara Romasanta, roma g, and Keith Barrett. Last night’s topics included the Google+ “Get Started List” (I think we all agreed that Scott Jarvie should be added to it), how Meagan Kunert ruined her career, Louis Gray’s post “Pictures or it Didn’t Happen,” and a few new Google+ enhancements added yesterday. Congratulations to Billy Wilson who correctly identified that Lotus Carroll was the first guest ever on Life Through the Lens and won a one-year SmugMug Account subscription. Thanks to everyone who showed up for last night’s show and we can’t wait to interview Jordana Wright next week, fresh off of her America by Rail photography tour! Thanks as always to our wonderful show sponsors, Adorama, Blurb Books and SmugMug. Be sure to check them out at http://adorama.com, http://blurb.com and http://smugmug.com! Posted on June 14, 2012, 8:11 am, by Thomas Hawk, under Photo Talk Plus. Well last night we had another great episode of Photo Talk Plus with the one and only Sly Vegas as our special guest. Sly talks about how as a recent newcomer to photography he has been able to advance the skills that are necessary to begin working as a professional photographer and getting paid for his work. Joining myself and Lotus Carroll are panelists Robin Griggs Wood, Keith Barrett, Jon Armstrong and Richard Hay. In addition to giving away a $500 Adorama Gift Card (congratulations are in order to Cameron Siguenza!) we discussed the new MacBook Pro announced last week (mine’s on order! ), the difference between CF and SD camera cards, upcoming photowalks including one in San Francisco this Sunday, the planning for a second G+ photo trip to Death Valley, and 65 photowalks now scheduled for June 30th for the 1 year Google+ Anniversary. We also talked about Jay Patel’s post about how photos from the iPhone will impact the photography business. Thanks to everyone who watched live last night and who support the show in the Vidcast Network chat room! Be sure and tune in next week when we interview the one and only Patrick Di Fruscia! Posted on June 12, 2012, 10:06 am, by Thomas Hawk, under Photo Talk Plus. Lotus Carroll and I are SUPER excited to announce that Adorama has joined Photo Talk Plus as a sponsor for our show. When we started the show we decided that we would limit the number of sponsors that we’d accept to four. All four companies had to be companies that we both naturally enthusiastically used and that we would feel happy supporting and personally endorsing. Adorama is definitely that type of company. I’ve bought lots of gear from Adorama over the years myself and have found them to always have consistent low prices and GREAT customer service. Our other two sponsors SmugMug and Blurb Books equally are companies that both Lotus and I can stand behind and personally endorse. Many in the photo community know Joel Meisels who has been Adorama’s public face to the photo community for a long time. Joel has been an instrumental advocate for photography in social media working for Adorama and Lotus and I are excited that we’ll get to work with him more now. Another Adorama great is Helen Oster. Helen actually personally assisted me in getting my Canon 5D Mark II a few years back when I hadn’t been able to get one for months. Helen has provided amazing service to photographers over the years and is great at engaging with social media for the company. To kick off our new relationship with Adorama, *we will be giving away a $500 Adorama gift card live to one of our viewers on tomorrow night’s show. * Be sure to tune in at 8PM PST when we interview the one and only Sly Vegas. Joining Sly will be panelists Richard Hay kora foto morgana Robin Griggs Wood Jon Armstrong and Keith Barrett. And the next time you need to buy anything camera related check out http://adorama.com where you will get a great price and great service on whatever you might need. Posted on June 7, 2012, 5:36 am, by Thomas Hawk, under Photo Talk Plus. We had a great episode of +Photo Talk Plus last night with the amazing +Catherine Hall. Catherine talks about her own work as a professional photographer as well as her work as a popular host on TWiT Photos and other community projects she’s involved with. We also discuss her iPhone/iPad app +Top Model Release and a number of the top G+ related photography stories this past week. Thanks as always to our show sponsors +Blurb Books and +SmugMug. Be sure and check them out at http://blurb.com and http://smugmug.com.